FiveThirtyEight has partnered with Facebook to gauge the popularity of the Republican and Democratic presidential candidates—in terms of likes. The project, called The Facebook Primary, compares the number of page likes each candidate has across the U.S., all the way down to the county level. The map below provides two separate data points: which candidates have the greatest percentage of likes in each state, and which contenders have the most disproportionate share of likes relative to their nationwide share. 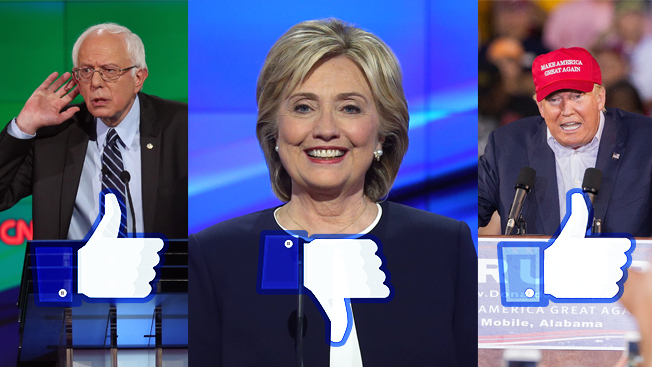 Some of the early findings include Bernie Sanders beating Hillary Clinton in Facebook likes by a margin of nearly 3 to 1. Donald Trump has more support than the other two top contenders, Marco Rubio and Ted Cruz, combined. Both Clinton and Trump are based in New York, but they dominate different parts of the city. And Rubio's support on Facebook is disproportionately high in his home state of Florida as well as Iowa and South Carolina. The data is as of Jan. 8 and will be updated as primary season rolls on. According to the Pew Research Center, 58 percent of American adults use Facebook, though its users are disproportionately young compared with the rest of the voting public. This would explain, for instance, why Bernie Sanders—whose campaign is largely fueled by younger voters and social media—is doing so well on Facebook. "The data isn't predictive of the election, but it is a revealing look at the preferences of many people who use Facebook and like the candidates' pages," said FiveThirtyEight managing editor David Firestone. FiveThirtyEight gained notoriety during the 2008 election when founder Nate Silver correctly predicted the results of the presidential election in 49 of 50 states, along with all 35 U.S. Senate races. In 2012, when FiveThirtyEight was part of The New York Times (before it was acquired by ESPN), Silver correctly predicted all 50 states.